Easter never looked so cute in one outfit. This green and white polka dot shirt has straps with pink angel wings. 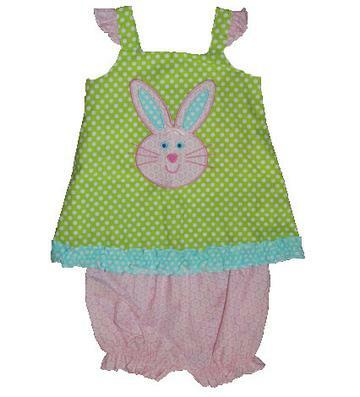 There is a pink and white bunny appliqued on the chest and turqoiuse and white polka dot ruffle along the bottom of the shirt. There is buttons down the back to get on/off easily and matching pink and white polka dot bloomers with an elastic waist and leg holes. This adorable outfit is 100% cotton.